NorthWest Specialty Baking Mixes offers retailers the secrets to a customized seasonal Dassant baking mix program that will maximize profits during the busiest part of the year. The secret to appealing to shoppers is to offer easy-to-make baking mixes in unique yet familiar flavors during the peak baking season only. A seasonal baking mix program provides the ideal opportunity for food retailers to maximize profits. NorthWest Specialty Baking Mixes offers retailers a strategic approach to what baking mix flavors to offer and when. These seasonal in-and-out programs are designed specifically to increase retailer profits, while fulfilling increasing consumer demand for premium baking mixes. Baking is a loving way of bringing families and friends together to reflect on fond memories and celebrate, especially during the holiday season. By promoting a seasonal baking mix selection, retailers will take advantage of the peak time of demand (September-December) and will capture the category’s greatest profit potential while providing customers with time-honored traditions. “Shoppers seek out seasonal and specialty items that are memorable, make them feel good, and are unique, much like an exciting treasure hunt. For stores, the secret to appealing to these shoppers is to offer easy-to-make baking mixes in unique yet familiar flavors during the peak baking season only,” explains NorthWest Specialty Baking Mixes’ Senior Vice President Diana Michelsen. Retailers can capitalize on that consumer excitement by prominently featuring strategic seasonal displays in their stores. NorthWest Specialty Baking Mixes helps retailers build their strategy by offering optional point-of-purchase or shipper floor displays. 1) Seasonal Sells Big. Retailers who offer seasonal in-and-out programs sell 3-4 times more product than items carried on the shelf year round. 2) Pumpkin is Top Selling Flavor. 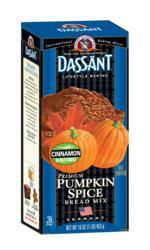 Pumpkin flavored mixes account for 41% of overall sales. 3) Seasonal Programs Perform Better. 71% of NorthWest Specialty Baking Mixes’ top retailers offer a seasonal in-and-out program. 4) Loyal Fans. Shoppers love Dassant and return year after year for their products. The average Dassant retailer has partnered with the company for at least 10 years. 5) Timing is Everything. Optimal timing for a seasonal baking mix program is delivery in August with the goal of selling out by January. NorthWest Specialty Baking Mixes offers seasonal baking mix programs for both private label and Dassant branded products. For more secrets, contact a sales representative or visit http://www.nwsbm.com. Since 1980 NorthWest Specialty Baking Mixes, along with its signature Dassant brand, has been nationally recognized for its creative approach in providing quick, easy and delicious home baking experiences. The company goes to great measures to ensure its baking mixes not only taste phenomenal but also are made with top quality premium ingredients. Dedicated staff is committed to helping retailers develop and deliver a successful premium baking mix program to their shoppers. For expertise in premium baking mixes, there is no better choice than Dassant and NorthWest Specialty Baking Mixes.